Click here to view the Download Information for the SAM4s SPS-320 cash register in Acrobat Reader (308 kb). Right click on the link to save the brochure onto your hard drive. Our customers and Gold Support Plan members have access to manuals, training videos, free software and support here. The SAM4s SPS-320 is a very versatile cash register. This model works very well in many different types of restaurants from fast food, snack bar, lounge, club, cafeteria and much more. The reason is because it features a nice size flat keyboard for you to list your menu items for one-touch selling. When you use a register in that manner you make fewer mistakes and your customer service is faster. A kitchen printer can also be added to the SPS-320 cash register for even more control. although this register won't force modifier choices it still works very well when a simple kitchen printing function is all you need. Interfacing credit card payments will increase the efficiency of this system even more. 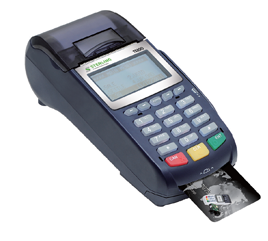 With certain merchant services this register is EMV compliant with a VX-805 pin pad. Don't waste time and commit errors double keying the sales into a stand alone credit card terminal when your payments can be interfaced making your cash register a credit card terminal too. The Smart ECR Credit card terminal from Sterling Payment Technologies connect directly to your cash register. Accept EMV Chipped cards, Swiped Cards and debit cards directly from your cash register. For more information about the EMV Credit Card terminal for the SAM4s SPS-320 cash register and of course you can call us at 1-800-863-2274 for additional information.